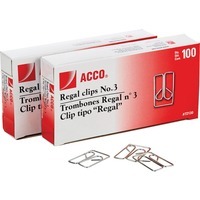 Regal paper clips feature a unique shape to provide an increased level of holding strength. The looped ends of the clip prevent you from accidentally tearing or scratching your secured papers. No. 3 size paper clips hold up to 20 sheets of paper at once. Paper clips are perfect for office, home and school use.